Dirty politics truly does exist on both sides of the political aisle no one can deny that. However, while dirty politics has been done by Republicans in the past, today's dirty politics is owned by the Democrats many more times than not. The Mueller “witch hunt” against President Trump and the trying to but thankfully failing slander and overt defamation of character assault perpetrated against now Supreme Court Justice Brett Kavanaugh are two instances that immediately come to mind. Done for political expediency alone, the Democrats will surely do any and everything necessary to make Republicans look bad while protecting their own...that is until a photo surfaced from the pages of current Virginia Governor Ralph Northam's 1984 yearbook that is. And by now most know the story of the photo and how Democrats are trying to distance themselves from one of their own. But for those who pay no attention to the news...and sadly that number encompasses many...the photo in question is a photo of two young men...one a white man in “blackface” the other a young man dressed in KKK grab replete with hood covering his face...both holding what looks to be beer cans. Two young men, one supposedly now Governor Ralph Northam, en route to a frat party in celebration of graduation from Eastern Virginia Medical School...blowing off steam as young men do but obviously not in what is today's version of a politically correct way to do so. The yearbook and the photo in question are almost 35 years old, and while the photo's caption lists no names as to who the two young med school graduates are, it does, however, appear on the now governor's yearbook page. Two and two usually does add up to four...as this very yearbook was from pre-Common Core days...but still without naming names there always remains the outside possibility...remember students themselves compose a yearbook's layout and composition...that the young man in “blackface” truly might not be Governor Ralph Northam. In fact, last week when the media made this story the “prime story” of its 24/7 news cycle, the governor did apologize for the photo in question, first saying it was him then a day later saying, "I am not the person in that photo." And now he appears to have old med school classmates to back-up that it was not him in the photo. Nevertheless, Northam was quick to add that in looking back on his younger days, he regretted "that I did not understand the harmful legacy of an action like that," and admitted that he did dress-up for parties as legendary black singer Michael Jackson a few times, something I see more as a compliment than anything to the contrary. So which one is it...is now Governor Ralph Northam guilty or not guilty of being the one in this particular photo in “blackface?” Truthfully I don't think it matters either way because until we entered the 21st century “blackface” was not all that uncommon an occurrence in theater, in cinema, or on television...think of Al Jolson in 'The Jazz Singer,' Sir Laurence Olivier in 'Othello,' and Desi Arnez in an episode of 'I Love Lucy' for example, and know that there were hundreds of other actors and actresses over the years who did just the same. And none of their portrayals in “blackface” were meant to be demeaning in any sort of way no matter what the politically correct say today. “Blackface”...originally but a form of “theatrical make-up”...was simply used by white actors to portray a black person, and not necessarily in a negative manner as “blackface minstrel shows”...a uniquely American artform...helped to transform what was then referred to as “formal theater”...think opera and serious plays...into more “popular terms” for the general public to enjoy. However, in today's oh so politically correct world “blackface” is deemed both offensive and disrespectful to black people, yet isn't it odd that white liberals and some blacks have no problem whatsoever when both black female entertainers and regular black women straighten and then dye their hair blond to emulate white women. Translation: today “blackface” is a no-no for all whites but “whiteface” is okay for black women. Hypocrisy from the left continues to both abound and astound especially when they need 35-year old photos to make their grievances publicly known while at the same time throwing in the call for revenge for good measure. And in the case of Governor Northam revenge against one of their Democrat own is the name of the game what with former Virginia Governor Terry McAuliffe and with Virginia's two Democrat senators, Tim Kaine and Mark Warner, now calling for Northam's resignation, along with Susan Swecker the head of Virginia's Democratic Party who recently stated that the governor “no longer has our confidence or support.” And let's not forget that Virginia's Legislative Black Caucus also issued a statement expressing a "deep sense of betrayal, pain and disappointment," as did Rep. Donald McEachin, a member of the Congressional Black Caucus, as well as Virginia's constituency throughout the state. And all this brouhaha is over a picture of a then young man from 35-years ago that might or might not be of the man they are so willing to throw under the political correctness bus. So the question is why are Governor Northam's fellow Democrats so willing to sacrifice him...one of their own? In Northam's case the answer is twofold, but in no way is it for altruistic reasons such as to further the cause of racial equality nor is it a shout out to the fact that in 1984, when this photo was taken, Congress finally passed, over President Reagan's veto, the Civil Rights Restoration Act. And don't think for a minute that Democrats deem this photo an affront to this most important piece of legislation for Democrats will always put party first over what's right and what's wrong and are now just catering to and hopefully garnering...or at least holding onto...the votes of Virginia's ever increasing black population. And so the “tarring and feathering”...if you will...of one of their own remains for the cameras over a decades old photo. Divert and deflect attention away from what should be about Virginia's removing from office the very man who as governor basically condoned the most unspeakable of all uncivilized horrors...infanticide...the premeditated murder of the most helpless amongst us...and is the same man who was more than willing to sign such vile legislation into law. But while Virginia's legislature thankfully failed to pass this so wanted abomination of a bill, herein lies the quandary the more moderate “blue dog” Democrats in the House face... Democrats who still have a conscience that is...do they jump on the Northam resignation bandwagon for the wrong reason as they know full well that their anger should not be focused on the silly “blackface” decades old photo, but that it should be focused on their party taking Roe v. Wade so far to the left that under Governor Ralph Northam's tenure that Virginia's still “unborn children” could have been murdered even after birth if the mother so chooses. In Governor Ralph Northam's own words...“If a mother is in labor, I can tell you exactly what would happen,” he said. “The infant would be delivered. The infant would be kept comfortable. The infant would be resuscitated if that’s what the mother and the family desired, and then a discussion would ensue between the physicians and the mother.” Allowable infanticide plain and simple...infanticide spewed from the lips of the man who is not only a governor but a pediatrician...a children's medical doctor...a doctor who took an oath to "do no harm"...thus making Dr. Northam a liar of the very worst kind. How far from grace some have surely fallen. And you can read more about that in my previous article New York's Descent Into Hell in the Op-ed section of my blog The Patriot Factor. So as the call for Northam's removal from office grows stronger amongst Democrats some forget that such an act is not that simple as each state has its own laws regarding such a practice. And while under the Virginia Constitution it clearly states that governors can be impeached by the House of Delegates, for "malfeasance in office, corruption, neglect of duty, or other high crime or misdemeanor" with the state Senate then bringing him to trial most likely for “malfeasance”...as in bad behavior. But with their needing two-thirds of senators to actually remove him from office Governor Ralph Northam is most likely here to stay unless he willingly steps down which most probably will not happen. And even with Northam now asking Virginians for the chance to earn their forgiveness by his saying that, “I believe this moment can be the first small step to discuss racism in Virginia’s history,” the Democrats continue to miss the real point of why Northam needs to be removed from office. And while a decades old photo might be in bad taste...and that's all the photo is in but bad taste...Democrats are using that photo as their weapon of choice while at the same time they are willing to let Governor Ralph Northam slide on his condoning and promoting of infanticide. Priorities are surely askew for the left side of the political aisle for while Democrats are calling for the resignation of a man who 35-years ago dressed up in "blackface" to attend a frat party, not a word are they saying about that very same man wanting the State of Virginia to allow the murder of the most defenseless amongst us. But then again this man's agenda is the Democrat's agenda and yet-to-be-born children are both their favored target de jour. And what better way is there to deflect away from that target than to put the focus on an act of long ago... an act of supposed racism that was anything but. Remember, Democrats believe that any act of racism...self-perceived or otherwise and with no expiration date...will always trump the right of the unborn to life. Two very rotten peas in one very rotten pod. And even if Governor Ralph Northam does resign by the time this article gets published, all I can say is that the Democrats and this most vile of men truly do belong in hell. For more political commentary please visit my RIGHT SIDE PATRIOTS partner Craig Andresen's blog The National Patriot to read his latest article The Inescapable Legacy of Democrat Racism. 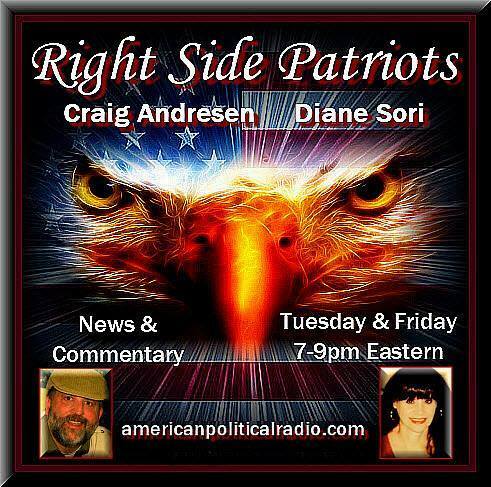 Tomorrow, Wednesday, February 6th from 7 to 8pm EST on American Political Radio, a special RIGHT SIDE PATRIOTS 'State of the Union Address' wrap-up show. And on Friday, February 8th, from 7 to 9pm EST on American Political Radio, RIGHT SIDE PATRIOTS Craig Andresen and Diane Sori discuss 'Remove Northam...But Not For A 35-Year Old Photo'; 'The Inescapable Legacy of Democrat Racism'; and important news of the day. The second Central American caravan has been heading towards the United States-Mexico border for awhile. 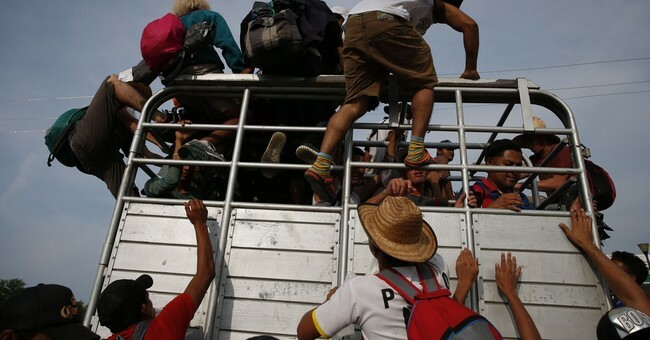 This new caravan was originally supposed to have roughly 2,000 people on it. According to Mexico, that number has multiplied and currently sits around 12,000. The caravan is expected to arrive at the border on Monday, in plenty of time for President Donald Trump's Tuesday State of the Union address, Fox News reported. To intensify orders, the Pentagon recently announced an additional 3,750 troops were being deployed to the border. 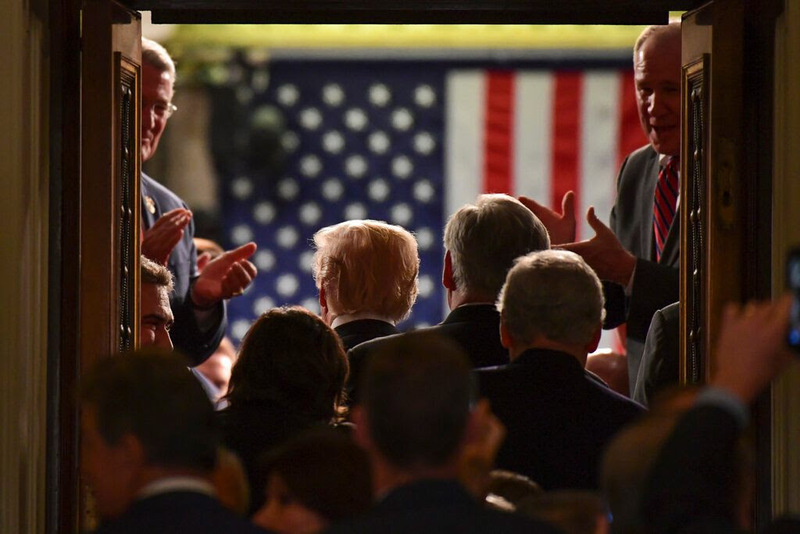 TRUMP TO CALL FOR UNITY - DURING A STATE OF DISUNITY: During his State of the Union address tonight, President Trump is expected to take on a role his fiercest critics say he is most unfamiliar with: Uniter-in-Chief. And Trump is expected to call for unity and stress optimism when he addresses Congress and the nation during his second State of the Union address ... But given the bitter partisan battle with Democrats, especially House Speaker Nancy Pelosi, over the border wall and another looming government shutdown, the question is whether Democrats will be receptive -- or at least give the appearance of decorum. Will they applaud or will they sit on their hands. What will Pelosi's expression be, as a nation observes her, in the background, over Trump's left shoulder, when he condemns "resistance and retribution politics" and makes his argument for strong border security via his wall? This is the drama that faces President Trump's State of the Union address.